Introducing the new Goldpaw Step-In SwiftLock Harness! Featured in our most popular colors, patterns, and coordinating stripes. 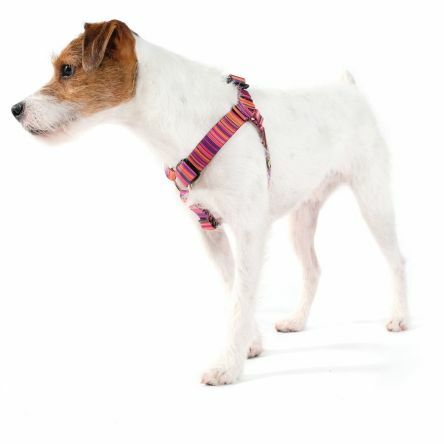 These vibrant collars are composed of super soft 100% recycled polyester tubular webbing, are fully adjustable, very sturdy, and feature a simple step-in design. The best part? Our magnetic SwiftLock buckle that makes gearing up for walk-time a breeze! It's the easiest to use buckle we've ever seen. Simply move the sides near each other and the super strong magnets inside close the latch for you. To remove, give the pull tab a tug and voila! The design is super safe; the more tension put on the ends, the greater the force required to open it - it's self securing! Clip the leash to the two shoulder D’s or to the ring in the front! Recommended For: daily wear, quick and easy harness removal, arthritic hands, leash training, discouraging pulling, preventing choking, squirrley dogs, and even children that want to take their pup for a walk.